You love your dog, be selective when choosing your dog walker--they are not all created equal! Don't choose just anyone. Demand the best for your dog. provides the BEST care for your pet! 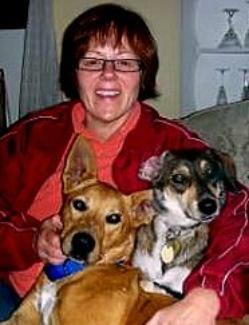 A New Leash On Life is owned and operated by Stacey Grieve, a woman who LOVES dogs! 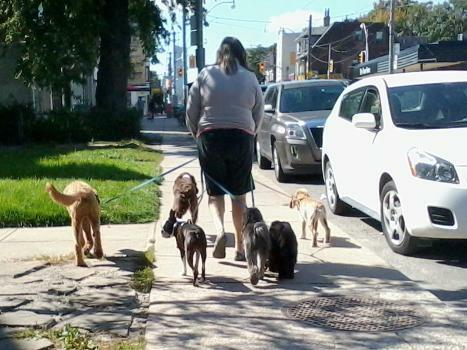 Operating in and around the Leslieville, Toronto area, let us help you with your dog. We all live busy lives; ensure that your dog gets daily exercise and fresh air regardless of what's going on with your schedule. A New Leash On Life is here to make life easier for you and your dog! *Canine Therapeutic Massage for your senior or injured dog. *Private walks may be arranged for existing clients only, and only when needed because of an injury, recovery etc. In addition to having two rescue dogs of her own, (Tater and Roogie), Stacey also volunteers at the Toronto Humane Society as a dog walker after completing the THS's Dog Walking Training, levels l & ll. She is also does a lot of networking through social media to help many of the shelter dogs find their "fur-ever" homes. Stacey has been instrumental in working with the City to further improve the Greenwood Park Off-leash area. Her efforts have lead to the installation of an irrigation system, a dog water fountain, and extra trees both in- and out-side of the off-leash section. She is currently working on getting lighting installed so that visibility and safety are improved at the off-leash area in the evenings. Stacey is also one of the administrators for the Greenwood Doggie Park Facebook page. Stacey has done two levels of Agility Training. Stacey has taken two Tellington Touch workshops. Twenty years experience performing Therapeutic Massage on both humans and canine. Carries all necessary Insurances and Licenses. Stacey is fully certified in Pet First Aid and CPR through Walks 'n'Wags. Stacey is a graduate of The Pet Professional Course, Toronto's only dog-walker/pet professional course, offered by www.Whattapup.ca.